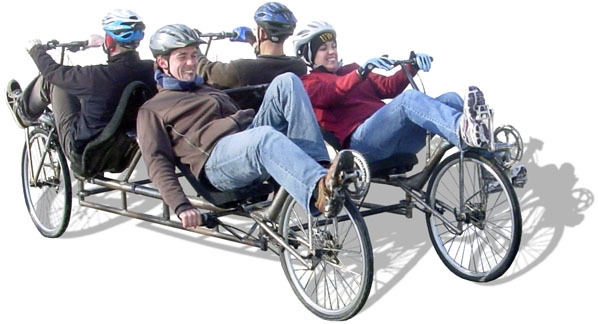 The Family Truckster is a four passenger quadricycle that splits in two to create two back to back recumbent tandems. The Family truckster features four independent drive trains. Passengers in the rear can either pedal backwards or install their chain in a figure 8 and pedal forwards. Passengers in the rear can also choose from two different handlebar positions. The Family Truckster can lean into turns thanks to three pin jointed cross tubes that link the two sides together.